Our March fair has for some years been on the second Saturday of March. In 2020 Simon Turner has moved his Pershore auction from the third Saturday to the second. After discission with the stallholders affected and some of the visitors we have decided to stay with the second Saturday, the 14th. We did clash with Pershore once before and it made no difference to our stallholders or visitors. Burton March 2020 will be the 100th fair we have organised. 47 Stafford/Burton, 24 Chiswick, 17 Bristol, 12 Reading/Bracknell. Apologies for the mistake in the advert in the Railway Magazine. This is not the first time their advert has been incorrect. They confused Chiswick on the 5th January with Burton! It will not happen again as we have decided that enough is enough and we will not be advertising in Railway Magazine in future. We will be continuing with Heritage Railway. Very busy day as usual for the March Burton. Probably a record, there were 140 in the queue waiting for the doors to open. Another busy and well attended day at Burton Town Hall for our 7th event there. Many happy collector's leaving with bulging bags of goodies. Another full house at Burton Town Hall. Probably our busiest fair there, lots of visitors staying all day. Food again was excellent and a very wide range of new and previous stallholders. It is a great shame we lost Stafford but Burton has become the perfect replacement. See you there in April. This looks like being another great event. Numerous stallholders already rebooked and there is a waiting list for new stallholders. Another very good day at Burton, a very good turn out of buyers and sellers, Car Parking was not as much of a problem as we feared. We have, therefore, confirmed our next booking for 21 November 2015. It is unfortunate that the Pershore Auction has been moved to this date having been advertised on another November date previously. From talking with our stallholders it would seem they will be at Burton rather than Pershore so we can expect another great event. Watch this space for news of 2016 dates. 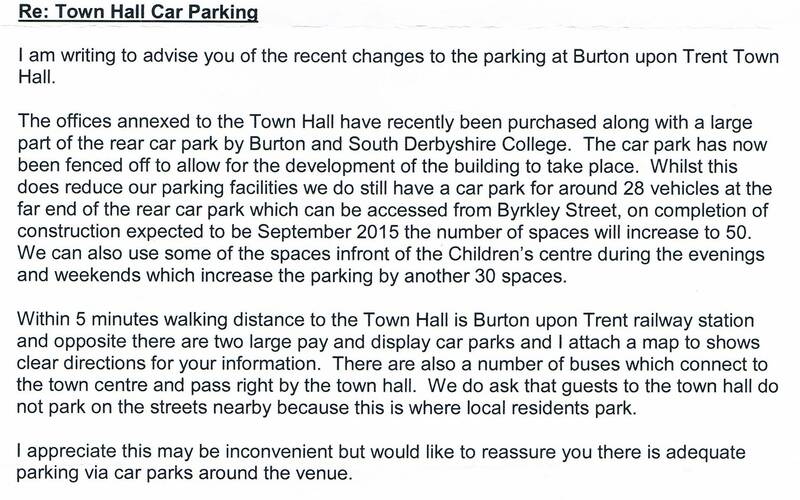 There is major building work taking place in the car park behibnd the Town Hall and the car park is closed. 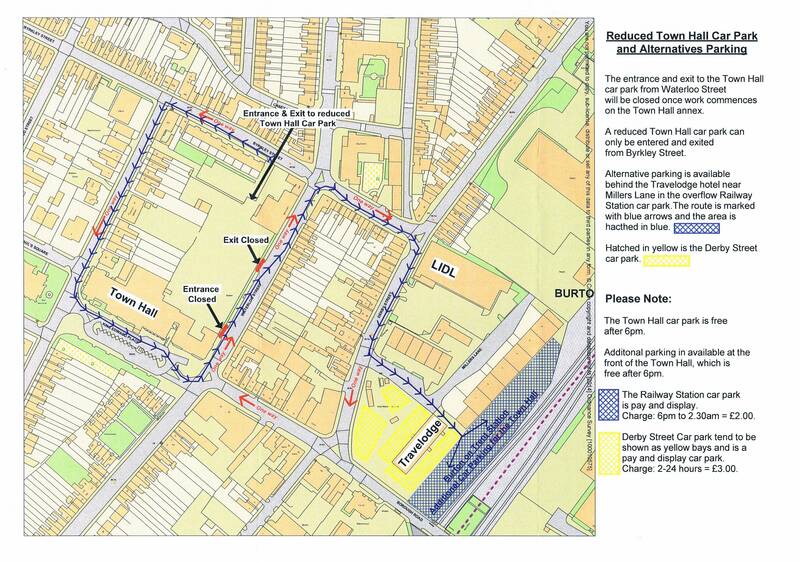 For parking information please see Parking Map. The Council Letter detailing the changes is here. There will not be a Bristol Collector's Fair in 2015. Attendance at Bristol has been falling over the years. In 2014 we hit an all time low, less than half the people who visited the last Burton fair. To try to breath new life into the event we got together with a Model Railway show organiser who was going to run a Model Railway show in the school at the same time as our fair. Having to find a date which was not already taken by a railway fair or model railway fair was difficult but one Saturday in September was free. Unfortunately, the school was already booked that weekend. We, therefore, decided to cancel Bristol in 2015. At present we hope to run an enlarged fair in 2016. After just two events at Bracknell we have decided not to continue with the venue. Although the hall is fine as is the cafe and parking we find the administration difficult to deal with. All in all the effort to actual make a booking etc is just too great. To compensate for the lack of this event we have booked a second Chiswick in 2015. The date is Saturday July 18th, Chiswick Town Hall as usual. Following on from the Stafford tradition we have booked a second date for Burton in 2015. Restricted somewhat by other railway events and bookings at the Town Hall we have settled on Saturday November 21 2015. A pre-Christmas treat! Bookings have really picked up in the last few days and are now closed. Many new faces will be there adding to the already vast array of items on sale. Do not miss it. The bus will be at the station waiting for you or you can, of course, use the large free car park. Next date for Burton booked for 18th April 2015. Re: the theft mentioned below. The tapes have been viewed and the culprit seen removing the books and hiding them under his coat. We await the police providing us with a picture of the thief. The stall holders supported us in our move to Burton and so did the customers. Thanks to all for making it a great day. Entrance was up by 10% over the last Stafford in March last year reversing a trend that had been going on for a few years. The food was back to what we really want to provide. We were never happy with the change at Stafford but now “pie and chips” are back. It is sad that one or two of our visitors decided to enhance their book collection by theft. Two incidents were reported to us. What the thieves probably do not know is that the whole building is converted by state of the art colour high definition CCTV continuously recording activities in all parts of the building. The recordings are to be scanned to identify the thieves. They may well be hearing from the stall holders involved. The date of the next Burton will be announced soon. BURTON IS NEARLY FULLY BOOKED. Just 3 tables left at Burton Town Hall in April. If you are thinking of having a stall get in contact NOW. After literally months of searching we have decided on a new location for our Stafford Fair. No suitable location was available in Stafford so we have moved 25 miles east to the Town Hall at Burton on Trent. The Town Hall is 5 minutes walk from the Railway Station. There is a large car park by the Hall and plenty of parking nearby. We are able to hold the entrance fee as before. Have we had the last Stafford at St Leonard's Hall? Sorry to say the answer is yes. We found out in February that the Social Club was closing down at the end of March. From April the Hall will be managed by a new company that does not have an interest in outside bookings. AUGUST STAFFORD IS THEREFORE CANCELLED. However, we really hope that we will be back in Stafford on March 1st 2014. Where ever we decide to go the bus from the station will take you there. We are pleased to report that even at this early stage (March 2013) the event is already over 75% full. Thanks to all the stallholders for supporting this change of venue. We have been considering our options over the Reading event for some time. We do not believe we are getting value for money for the huge amount it costs to stage. Those who visited in May 2012 will have noticed a lack of tables in the cafe, not a major problem but another reason to look elsewhere. We have looked at the new Bracknell College Hall and find that it is a fantastic replacement for Rivermead. We distributed a flyer at Reading. Please note this is NOT the Leisure Centre that many associated with events in Bracknell. We are sorry about the problem with the lack of tables in the dining area at the March 2012 event. It seems that the tables either get broken or just disappear. I am assured that more tables will be available for our August event. On that subject we did consider moving the date as it clashed with the Olympics but no one we spoke with seemed that interested in the Olympics so we are staying with our usual date. If you are using the Bus from the station PLEASE READ the notes on the Reading page about where the bus will pick up this year. Major works still continue at Reading station. Why the change of date to May, we keep getting asked? It all because of the change of the date of the end of May Bank Holiday to the first weekend in June. This is now a long weekend Tuesday is a Bank Holiday as well as Monday. This is probably a record. Stafford in March 2012 is full already (August 2011), with a waiting list for stallholders. Due to the move of the May Bank Holiday to the 2nd June in 2012, Reading Rail-Bus will move back a week to Saturday 26th May in 2012 only. With a month to go to the event the organisers have cancelled the 2010 Wolverton Works Open Weekend. This is incredibly annoying for us as we had put ourselves out to cancel our Stafford event on the same weekend. This cancellation has cost us money. The organisers of Wolverton say that the lack of advanced ticket sales has forced them to cancel. I should say postpone rather than cancel as they plan to have another go in 2011. We have some views on the lack of ticket sales and would be happy to discuss these with the organisers if they should be reading this. Many people have already got in contact with us asking us to re-instate Stafford in August this year. It is a nice idea but totally impractical. The hall may not be available, we have just spent money advertising that it is not happening and there is now no time to run new adverts. So, sorry cannot be done. For the first time since we have been running Fairs (August 1995) we have decided to cancel one of our previously advertised dates. This August's Stafford will not take place. Unfortunately the Railway Magazine has decided to hold a Works Open weekend on the date we had booked. Given that many of our stall holders will want to be present at the Open Day we thought we should move our date. We could not move to the previous weekend as both of us, along with many stall holders, will be attending the Bluebell Railway's 50th Anniversary Weekend. (An event not to be missed). Moving later would mean 3 events in a row and we felt stall holders, and ourseleves, might like a holiday. But don’t despair Bristol is on 18th September so you will not have to wait long. And talking of Bristol, this year we shall be moving to the new school building currently under construction. It is on the same site just a bit nearer the railway. With events up and down the Country be cancelled due to the weather, Chiswick was one that did go on as planned. Thanks to all the stall holders who attended and, of course, a big thank you to all of you who came to buy. Attendance was only down by 10% from last year and even with that small drop many stall holders reported bumper sales. We have now seen two events, Stafford and Bristol, pass by while the Credit Crunch is occuring. Has it made a difference? One the one hand, probably. Attendance was down at both events, not by very much but down all the same. On another, probably NOT. Dealers at these two events report boyant sales, many breaking sales records. I think we need to tell Network Rail when our Stafford event takes place. The date always seems to attact some problem with the network. On March 1st 2008 the line to Stafford from London was closed by containers as was the line from Carlisle. We missed seeing many of our regular visitors. Let us hope that in August Network Rail and our visitors have a better day. Even with our costs still rising we are holding our entrance fee at £2 for our non-Reading events again this year. The costs of running the Reading event rise faster than the others so we have no choice but to raise the entrance fee there to £3 from June 2008. We are sorry, but from 2007 we are going to have to raise the entrance charge to our events by 50p. Costs of running these events go up and up continuously, hall rent, advertising, etc, etc. Entrance to the events will now be £2 except for Reading which will stay at £2.50p. Given the high quality stalls at our events we still believe this is very good value for money, especially given that some collectors events now charge up to £4 entrance. Please note that the change of date of Bristol 2006 published in the September edition of the Railway Antiques Gazette is INCORRECT. The event has not moved from 30 September, a date that has been advertised for over a year. Stafford in August 2006 will be our 40th event. We started in August 1995 at Stafford, adding Bristol in 1998, Chiswick in 2001 and Reading in 2003. In that time we have provided collectors with about 3 miles of stalls and had a visitor for each foot of stall. 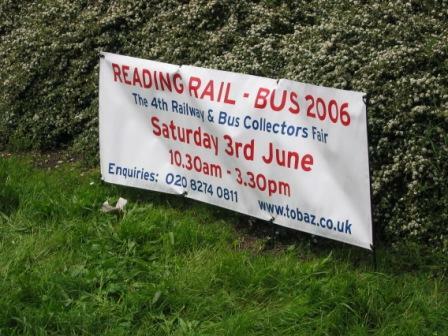 To give motorists something to read while waiting in the traffic outside the Rivermead Leisure Complex we erected an advertising banner for our Rail-Bus 2006 event. Strangely, Reading Council do not allow RAC/AA advertising signs around Reading but do allow banners to be placed in the grass verge outside the Leisure Complex! On a sunny day the free Routemaster shuttle approaches Rivermead Leisure Complex, Reading passing our banner advertising the Rail-Bus 2006 event. Hundreds of our visitors make us of this service; it has already been booked again for our 2007 event. We hear rumours of an auction being planned for 2006 using St Leonards Hall at Stafford. We would like to put on record that we have no connection with this auction and are unable to give any information about it. 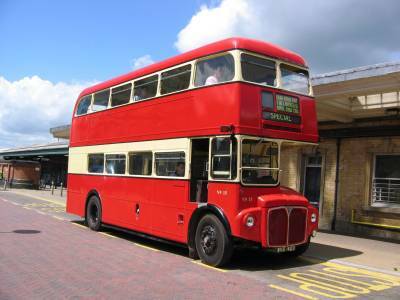 Our Routemaster waits at Reading station for it's next load of passengers on their way to Rail-Bus 2005. Visitor numbers to Reading in 2005 broke all records for all our events. A new folded A4 leaflet has been produced containing details of all our events. Pick up a copy when you visit us. There was a record number through the door at Chiswick January 2005. New and old stallholders brought with them the widest range of material yet seen at Chiswick. An excellent day for both buyers and sellers. As Crewe Works are holding Open Days on the 10/11th September 2005, the railwayana event calendar for September has changed. The Sheffield Auction is now on the 17th and our Bristol event has changed date to the 24th. 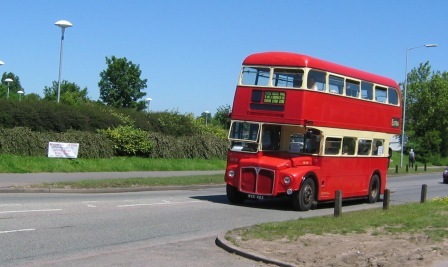 At the June 2004 Reading event we operated a free Routemaster bus between Reading Station and Rivermead Leisure Centre. We are pleased that this addition to the Reading event was a great success with 341 single journeys undertaken. This free bus service will now be a permanent part of the event.